A couple of weeks ago, I asked people to share an announcement about Invisible 3, saying that if we got at least 100 retweets, I’d do a livetweeting of the 1982 made-for-TV film Mazes and Monsters. 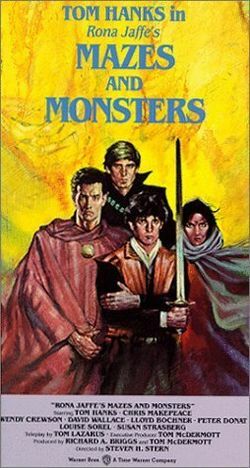 The film is based on the novel of the same name, by Rona Jaffe, and warns of the dangers of fantasy role-playing games. 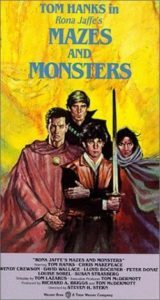 It’s based at least in part on rumors and legends of students sneaking into the Michigan State University steam tunnels to play Dungeons and Dragons and disappearing. Most of this background is, as you might imagine, complete bugbear twaddle. On the other hand, this was a chance to see Tom Hanks in his first starring role for film. You’ve got Robbie (Hanks), a troubled kid whose brother vanished years ago. He comes to a new school after failing out of the last one for playing too much Mazes & Monsters. He tries to avoid M&M’s siren song, but because he’s “Level Nine,” Kate, Daniel, and JJ really need him to join their game. When Robbie and Kate hook up, JJ gets depressed and talks about suicide, but instead decides to run a live-action version of M&M in the local caverns. Robbie promptly has some sort of mental break and “becomes” his character, on a quest that takes him to New York City to find the Two Towers. All four kids seem to come from rich families (I’m not 100% sure about Kate), because the film is so much more powerful if it shows that even rich white kids can be broken and destroyed by the evils of role-playing game. There’s also a bird, a lot of hats, a mother who likes to redecorate her son’s room, and a skeleton having inappropriate relations with a flashlight. I’m embedding the Storify of my tweets below. If any of this makes you laugh, or if you just want to show your support or sympathy, please consider checking out Invisible 3 and/or leaving a review. Thanks! In the early days of the internet, back when we were on Prodigy or CompuServe and email addresses were long strings of numbers with a comma in between, I was answering distress calls on derelict starships. America Online (because it wasn’t yet AOL) launched an ad campaign that envisioned an internet with graphics; I dodged Borg at Warp Six. I outsmarted Q when he appeared on my bridge, launched photon torpedoes at Romulans, and flirted with fellow Starfleet officers in Ten Forward. I was thirteen. And like a good overachiever, I wondered if I could list being second-in-command of the CompuServe sim group Fleet 74 on lists of my activities and accomplishments, right next to years of piano lessons, parts in theatre productions, dancing and singing in the community show choir, and the environmental and video game clubs I’d started (and of course led as president). My father is an aerospace engineer; by the time we moved from Singapore to the US, I was five years old and already lived in a world where discussing warp drive was normal. My AP Biology teacher was shocked when I mentioned a singularity in class one day, surprised that a high school senior would know the term (which she made me define in front of the class before she was satisfied), but I’d been raised on a steady diet of Star Trek, Star Wars, Babylon 5, and every science fiction and fantasy novel I could get my hands on—my father handed me Isaac Asimov books in elementary school and I read them, wondering why I didn’t have a robot nanny or automatic food-making gadgets. I am a native speaker of technobabble. All that to say: I’ve always been a nerd. And proudly so. But growing up I rarely saw people that looked like me onscreen—sure, we had Sulu, but George Takei was closer to my grandparents’ age than mine. Asian characters were few and far between, and girls? Girls didn’t like Vulcans or computers. Girls especially didn’t like dancing and princesses and talking about the space-time continuum all at the same time. Or so I was told. But I was Asian. And female. And I existed. I was the girl who hung out at the arcade playing Street Fighter II and Mortal Kombat, first surprising boys who saw a girl in front of a fighting game, then shocking them when I won. I was the foreigner who walked into first grade in the middle of the school year, a Chinese kid from another country but a native speaker of English. I was the founding member of the high school forensics team who learned quickly that judges gave higher ratings to performances of minority stories by minority students than they did mainstream stories by minority students—so while the handful of black students I competed against performed passages from Toni Morrison’s The Bluest Eye, I lent dramatic flair to Amy Tan’s Joy Luck Club. I often won. Growing up, the few Asians I saw in media invariably fell into tropes: the martial arts master, the submissive woman, the uber-nerd/scientist, the Dragon Lady seductress. None of these matched my personality. While I was able to beg my way into flute and voice lessons—in addition to piano—my father refused to let me study tae kwon do on the grounds that it would be “like handing a kid a loaded gun and telling him not to use it.” People told me I was bossy—my heroes were characters like Princess Leia and Babylon 5’s Delenn, forces of personality who were fully themselves and didn’t need rescuing. I was more Captain Kirk than Yeoman Rand. I was a geek, but I had far more interest in music and dance than I did in math or chemistry; science interested me primarily as story. And I had no idea what it would mean to be seductive—my conservative evangelical church preached “modesty,” and Bible camp banned spaghetti strap tank tops, two-piece swimsuits, and short shorts on the grounds that they would evoke lust in the boys. As an Asian-American theatre major, so often I was cast as that literal Other: I spent two summers performing A Midsummer Night’s Dream in college. The first year, I was one of the fairies. So were most of the black students. The one who wasn’t a fairy was cast as Hippolyta, the Queen of the Amazons. The second year, we reprised the show; I was cast as Hippolyta. All of the black students were fairies. The Greeks and lovers were uniformly white. How often do we cast an Asian-American as the protagonist, the superhero whose origin story we follow? How often do we allow an Asian-American to lead a movie as a swashbuckling rogue, the resistance fighter who marries a princess along the way, the rockstar with thousands of screaming fans? Hollywood casts Tilda Swinton as the Ancient One in Doctor Strange, Scarlett Johansson as Major Motoko Kusanagi in Ghost in the Shell, Mackenzie Davis as Mindy Park in The Martian—with so few roles available to begin with, we’re often denied even characters who should look like us. We’re over 5% of the US population, but only 1.4% of the lead characters in studio films released in 2014. According to Annenberg School for Communication and Journalism at the University of Southern California, the majority of media features zero named or speaking Asian characters. Zero. Two years ago I attended a curated acoustic music showcase where every single one of the musicians was a white guy with a bushy beard. Most of them wore plaid. Producers often think of diversity in terms of instrumentation or musical style; I’ve released two albums of original music, toured 10 states, and performed hundreds of shows, but it’s rare to see another folk singer-songwriter of color. While the genre is dominated by white people, Asian-Americans are making this music. And making it well. We exist, but we’re not part of the narrative. Living in a world where people who look like you are functionally non-existent yields odd fruit. As an ambitious elementary school kid, I wrote (what I considered then) a novel. Starring ninjas. Based heavily on the Ninja Gaiden video game. Of course I Mary Sued my way into the story. But I always envisioned my surrogate as white. And male. (Because, we’re told, the appropriate protagonist of an adventure story is white. And male.) Likewise, when I wrote other stories, every character—heroes, villains, NPCs—was white. Bryan Lee O’Malley of Scott Pilgrim fame talks about how he never realized that he’d whitewashed himself out of his own story until seeing his comic in movie form and realizing that no one looked like him. As I’ve talked with other Asian-Americans, I’ve realized that I wasn’t the only one—many of us did the same thing. Even the excellent Ted Chiang—one of my favorite writers, and the first Asian-American I can recall encountering in science fiction—falls into this. We’re so conditioned to believe that white is the default that we write ourselves out of the worlds that we create. I refuse to be invisible. Faced with a culture that minimizes the existence of Asian-Americans in the arts, I’ve long created my own projects. In 2012, I founded Raks Geek, joining my love of geekdom and dance to form a nerd-themed bellydance and fire performance company that features a primarily Asian and LGBTQIA cast. While our society pigeonholes Asians as socially-awkward scientists, perpetual foreigners, and weak submissives, I’m determined to show Asians can be creative, tough, and unconventional. A body on a stage makes a statement. A female, POC body on a stage makes a statement. When I dance, I’m changing the narrative, the story of what an Asian-American woman is allowed to be. When I dance with Raks Geek, I’m making an audience laugh at the ridiculousness of a Wookiee shimmying, but I’m also bringing a new audience to an insular dance form, teaching them what bellydance looks like at a high level of technical and artistic proficiency, and defying a host of model minority and immigrant stereotypes. Visibility matters. Few would conceive of an Asian-American bellydancer performing as a Wookiee. Or Mystique. Or the TARDIS. But I do, and I hope to challenge perceptions of who we are and can be every time. We exist, and we have always been here. Dawn Xiana Moon is a lifelong geek that has worked professionally in almost every area of the arts. She the Founder and Producer/Director of Raks Geek, a nerd-themed bellydance and fire company that’s garnered acclaim from WGN-TV, MSN, Chicago Tribune, The Daily Mail, and UK Channel 4 TV. As a singer-songwriter, Dawn has performed in 10 states and released two solo albums; her latest CD, Spaces Between, fuses elements from traditional Chinese music with jazz and alt folk pop. She performs with Read My Hips tribal bellydance, spins fire with Acrobatica Infiniti circus, works as a UX designer and web developer, and has written for Uncanny Magazine, The Learned Fangirl, and RELEVANT Magazine. Though she loves Chicago, she periodically needs to flee the US; her wanderlust has brought her to 20 countries (and counting!) thus far. Work on Invisible 3 continues! At this point, we have signed contracts from all contributors, and our marvelous introduction-writer is hard at work writing the introduction. 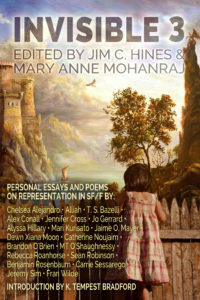 We also have cover art, which includes our list of contributors! The introduction arrived in my inbox shortly after I posted this, so we can also announce now that it’s by K. Tempest Bradford! We don’t have a firm release date yet, but it won’t be too long now. for your amazing work. We can’t wait to share it with the world. Invisible 3 is running a little behind the schedule I’d hoped to meet. It turns out that coordinating between two editors takes more time than one editor doing it all himself. Who’d have guessed? Mary Anne and I have 13 essays and 3 poems contracted thus far. We’ve got one revision to look over, and two rewrites we’re waiting to receive. We’re also missing a few author bios I need to follow up about. Cover art is mostly done, but I need to confirm those last few names before we can finalize that. We’ve sent the contents off to the person who will be writing the introduction for this volume. My hope is that when I get back from Buenos Aires and have had a day or two to recover, we’ll be able to announce a tentative release date (I’m guessing May or June, but I reserve the right to be wrong in that guess) and move forward with the cover reveal. I’m very happy with what we have so far, and I can’t wait until we’re able to share it with you. 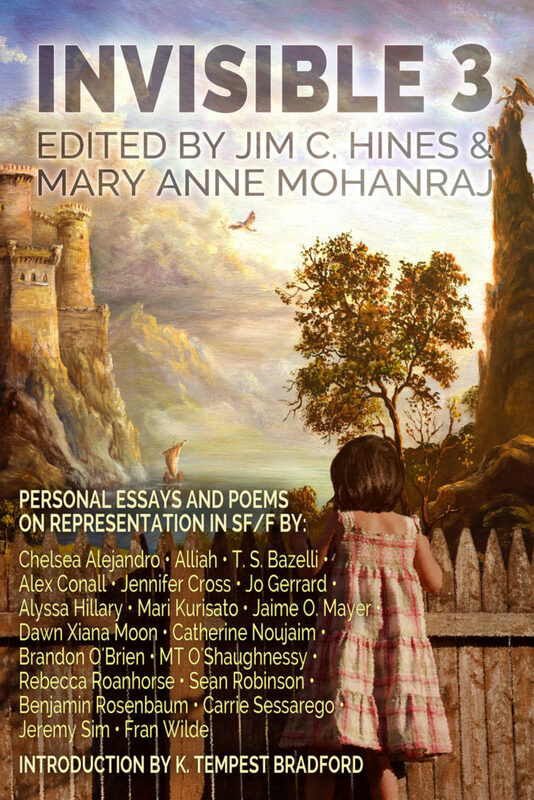 In 2014, twelve authors and fans shared their stories about the importance of representation in science fiction/fantasy in Invisible. In 2015, seventeen more people came together for Invisible 2. Their essays are personal, powerful, and very much needed. These stories help to create understanding and connection. They expose the power of our genre both to help and to harm. I’m thrilled to announce that I’m partnering with author and editor Mary Anne Mohanraj to begin work on Invisible 3. While the primary focus is on these personal essays, we’d like to incorporate a few poems for this volume as well. As in previous years, accepted works will first be published online, and then collected and published as part of the Invisible 3 anthology. Contributors will receive a $10 payment. ETA: I’ve had two reports of emails bouncing from that invisible address. Most submissions appear to be coming through fine, but if you have any trouble, you can use my backup email address: jchines42 -at- hotmail.com. By January 1: Mary Anne and I will contact potential contributors to let them know whether we’re able to use their suggested essays/poems. By February 1: Contributors write and submit their works. Mary Anne and I will read and follow up with revision requests as needed. By March 1: Final essays due. March 15: Begin running the essays online. By April 30: Publish Invisible 3. Please comment or email if you have any questions or concerns. Mary Anne Mohanraj wrote and edited Bodies in Motion, The Stars Change, and twelve other titles. BiM was a finalist for the Asian American Book Awards and has been translated into six languages. TSC was a finalist for the Lambda, Rainbow, and Bisexual Book Awards. Mohanraj founded Strange Horizons, directs the Speculative Literature Foundation, and is an English professor at the University of Illinois at Chicago.